Steven Raichlen is a writer, TV host, and multi-award-winning author – but he may be best known as the man who gave barbecue a college education. He is the definitive authority on grilling traditions around the world. He’s hailed for his relaxed teaching style, tips, and accessible recipes. Steven takes the fear out of cooking outdoors over a live fire. Raichlen wrote the best-selling Barbecue Bible cookbook series (Workman Publishing – more than 5 million copies in print), and his most recent book, the 780 page Planet Barbecue, documents 2 million years of grilling in 75 countries on 6 continents. His TV shows, Project Smoke, Primal Grill™ and Barbecue University™ rank among the top rated on PBS and have helped people all over the world ascend the ladder of grilling enlightenment. He also hosts two French language TV show called Le Maitre du Grill and La Tag BBQ. 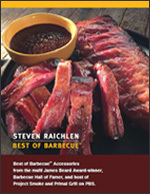 Steven Raichlen’s Best of Barbecue™ brand is a signature line of tools, fuels, flavors, and accessories created with a commitment to bringing professional quality barbecue tools to every griller. Steven’s brand offers a complete toolbox for the griller of any skill level. Traditional wood chip or pellet smokers create a smoky environment within your grill that adds delicious flavor to your meal. But these small-but-mighty smoke pucks pack even more punch! Directed vents force the smoke out exactly where you want it: onto your food. 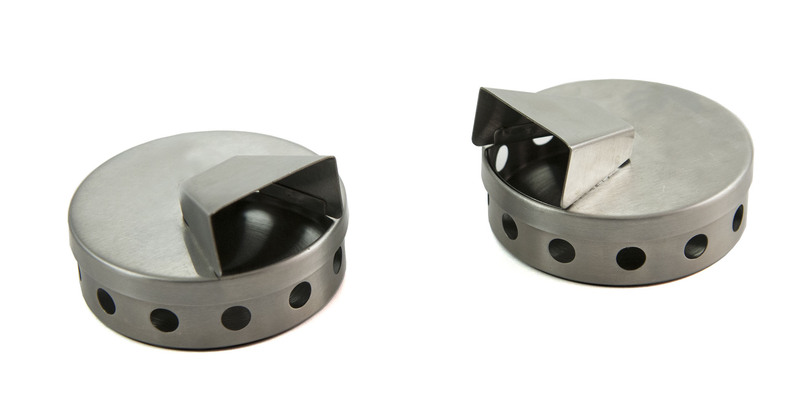 This set of two pucks also allows you to surround your meat with flavor, and their small size lets them get in close! These pucks can use either wood pellets or traditional wood chips, and even better, you can skip soaking the chips ahead of time and pour them right into your smoke puck! The all-in-one Grill Grate Oiler keeps a steady supply of oil at the ready while applying a wider swathe of lubrication than other brushes. The oiler features high temperature resistant plastic and silicone, as well as a heat shield to protect your hands during use. The oiler comes with a tray to catch any excess oil drops from the brush and provides a surface for priming the device. Detailed descriptions of the Steven’s Best of Barbecue™ grilling and barbecue accessories. Download the 2016 Steven Raichlen catalog.